With products that have been used conventionally. It can be used safely and securely. I am satisfied with the price as well. This review is about item#34970302. Mainly used for office work. Since the correction tape is decided this, there is a refill I think that it is very economical. This review is about item#34970311. I always use it very useful. Thanks to the replacement cartridge it is economical. There are convenient ones and we are using it. Rather than going to a local stationery store to buy it, I will purchase it more than Monotaro. I am happy that it is cheaper than other stationery stores. This review is about item#09524977. I will use it for office work of reception work. This is the most convenient for now so far. 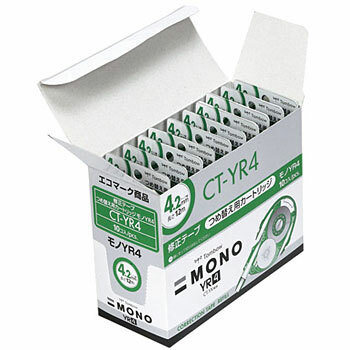 It is also a cartridge-type eco product. I am using it because it is cheap economically. It is hard to break. I always bought it with confidence because it is a used product. It was good that I bought cheaply because there was a discount this time.